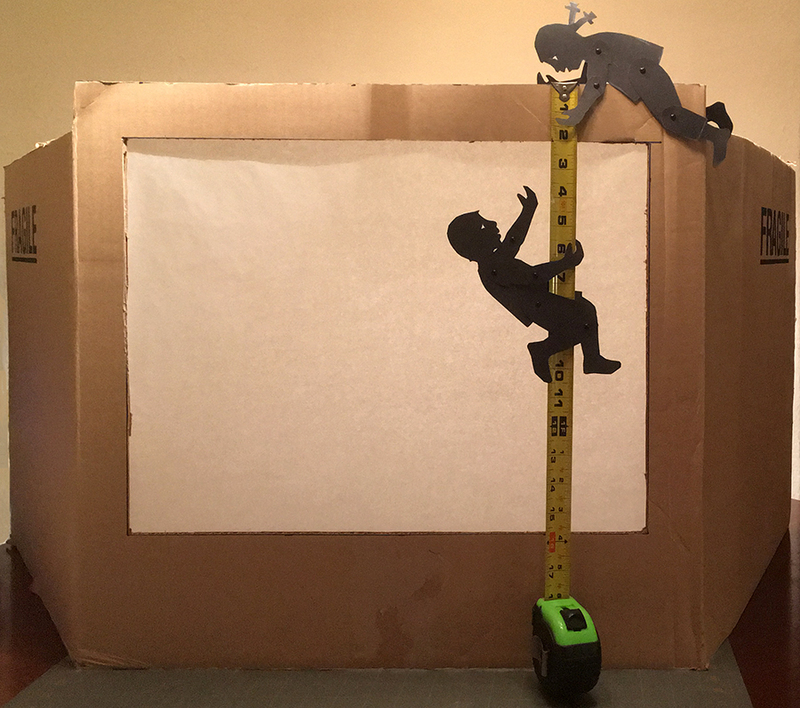 If you want to use a box as your shadow puppet theater, the size of the screen will depend on the size of the box that you use. For puppets the size of about 10″ tall (the size of a the puppets of our templates) you will need the following supplies. Choose the best surface of the box to serve as the front part of the theater, leaving the two adjoining sizes for support. Draw a rectangle that is 14″ in high and 18″- 22″ wide, depending on the width of the box. The borders from the top and the side should be about 2″ wide; the space beneath the screen should ideally be 5″ or higher. If you want to act out stories you will need to keep puppets in place by attaching the holding rod underneath the screen. In addition, you might also like to use props (a table, a manger, a beanstalk, etc.). To keep puppets and props in place, you can stick a single or double row of velcro strip underneath the screen, which will allow for easy attaching and removing from the screen. Alternatively, you can use paintings or masking tape, which can be easily removed without tearing the cardboard. If you sit in front of a window daylight might be proficient. If not, darken the room and attach a clip-on book light on the top of the screen or use a cellphone flash light behind the screen, supporting the flashlight with a book or other object to get the right angle.